REPOST: Vintage shopping radio spots! 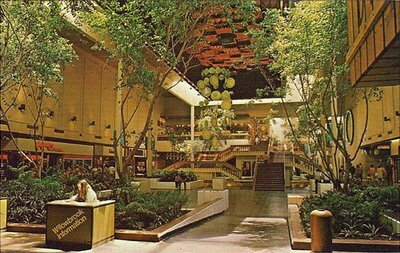 Amazing photo of the decidedly jungle-like interior (in this view anyway) along the mall proper at Willowbrook (a mall I've blogged about before). As an added bonus, you can also see the the information booth--complete with woman manning it. Pretty cool if you ask me. 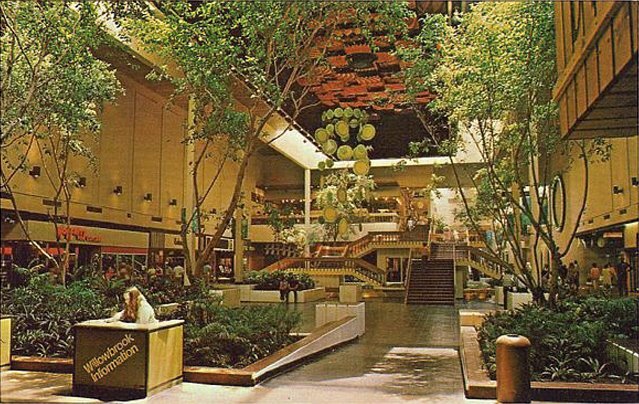 This shopping center is still around today, sure, but I'll bet it was a lot more fun to stroll through in 1973. Their current website is right here. Wow ... what a time machine of the shot! Here's a little trivia about Willowbrook, or at least a little info as to what's out there in terms of what may be "out there": A couple of years back (before blogs) I was trying to put together a mall book ... I spoke to Willowbrook people, and apparently they DO have a good stash of pix from back in the day! Willowbrook is quite the archetypal American mall in terms of stores and design ... GREAT STUFF! Anymore pix? Love the ceiling design and that trippy looking mobile. The picture looked like jungle back then but it asks more like one today with half of patterson there. Given the era, it coulda just been a long haired guy in that info booth. Cora: That mobile fascinated me as well. Swanky! Anonymous #2: Did you mean it's more like a jungle today because it's so crowded? That what you meant about half of Patterson being there? I didn't realize Willowbrook had an interior with so much volume. He's refering to the black people who are from Paterson. (That city has a large African American community.) That's why I made my comment about him being a racist, which appears to have been erased. Because, all my life I've heard (and used) this phrase to denote a "busy", crazy place; "man, it's a jungle out there! ", or "the place is a madhouse...it's a real jungle! ", etc, etc. You know. If he/she doesn't clarify soon, guess I'll go ahead and remove it to be on the safe side. Thanks for the input, William. That's fair, Keith. Thanks for the explanation--I appreciate it. That pic sure does bring back memories of the Willowbrook of old...this mall was very unique beacuse of the mall's setup/layout (one of the upper level promenades was a tunnel), as well as the center court fountains. The 89 construction made the mall more light, airy and modern, but also changed the fountains into two non-descript waterfalls. Sadly, they just got rid of the center court fountain near the Bloomingdales side of center court. On the positive side though, the new stores recently added have made Willowbrook a shopping destination in North Jersey. I remember the mall going back to 1970. I really loved the old "anchor" stores such as Bambergers, Orbachs, and Sterns. My favorite store by far during that era was called "Smuggler's Attic" which was owned by one of my parents' friends from Montville. It had really cool stuff back in the day! These pics bring back great memories! Do you have any other pics? These pics bring back great memories! Do you have any more pics?